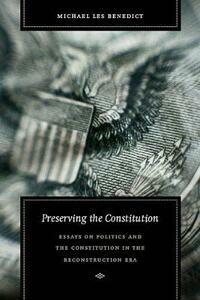 "Americans' ideas about constitutional liberty played a crucial role in the history of Reconstruction. They provided the basis for the Republican program of equal rights; ironically, they also set the limits to that program and reduced the prospects for its success. Americans were as concerned with preserving the Constitution as they were with changing it to protect liberty and equal rights. These two commitments were in profound tension. The question was how one could change the constitutional system to fulfill the promise of the Declaration of Independence-to entrench a republic dedicated to liberty instead of slavery-and yet preserve the essentials of federalism and local democracy. Almost 150 years later we still struggle with these problems." -Michael Les Benedict, from the Introduction Historians and legal scholars continue to confront the failure of Reconstruction, exploring the interaction of pervasive racism with widespread commitments to freedom and equality. In this important book, one of America's leading historians confronts the constitutional politics of the period from the end of the Civil War until 1877. Benedict updates ten of his classic essays that explore the way Republicans tried to replace the slaveholding republic with a nation dedicated to freedom and equality of basic legal and political rights-and how Americans' constitutional commitments, and those of Republicans themselves, limited reform. Expertly bridging legal, political, party history, the essays explore the fate of the Thirteenth, Fourteenth, and Fifteenth Amendments, as well as the struggle between President and Congress over the course of Reconstruction. Brought together for the first time with a new introduction, and revised to reflect emerging scholarship, the essays are essential points of departure for students and scholars in history, law, and political science.